Reishi mushrooms. The name can bring to mind Chinese emperors, ancient forests, and dusty old herbal apothecaries. Not surprising, as reishi has been used in China for over 2,000 years! This mushroom has a long history of use as an herbal medicine. Modern research is now confirming its healing power in the body. Let's take a look at this powerful medicinal. I'll start with some basic facts and move on to the reported health benefits. Then I'll explain how to start supplementing and end with some final thoughts. Due to the popularity of this page, I've added some other pages as well! See the related pages section on the right to learn more. Click here to share a reishi story with visitors to this page! A few species of mushrooms are referred to as "reishi" (including Ganoderma oregonense and Ganoderma tsugae). For this article we'll focus on the most popular form of reishi, Ganoderma lucidum. More about these other species is here. Reishi appear shiny and brilliant when wet and dry to a dull, dusty color. All species of Ganoderma are defined as polypores. This means they have no gills on their undersides and release spores through small pores. If you flip a reishi mushroom over you will see the flat, corky area where spores are released. Younger, new growth on the mushroom emerges as a white ring around the outer edge. Originally found in China, Japan, and Korea, reishi now grows on hardwoods throughout the world. They prefer tropical and subtropical climates. 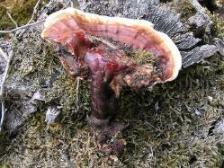 Reishi grow on hardwoods such as maple, oaks, and elms. They are very rare to find in the wild so most reishi sold today is cultivated commercially. Most people classify reishi as a saprotroph but some countries (such as Australia) have defined it as a parasite. Most will have a red or brown cap with a roughly oval or kidney shape. However, if carbon dioxide levels are high enough a cap will not form and the mushrooms will display long "antlers" or "fingers" instead. Reishi is a very safe mushroom to take as a supplement. There are no known side effects beyond some possible dry mouth which will go away with occasional breaks in usage. However, like most herbal medications, it's important to stop taking it before having surgery. Reishi is known as ling zhi (mushroom of immortality) in China and mannentake (10,000 year mushroom) in Japan. It is sometimes also referred to as the "herb of spiritual potency." The Japanese government officially lists reishi mushrooms as a cancer treatment. Do you have any of these conditions and have benefited from reishi? Please contact me, I'd love to hear your story! You don't need to be suffering from a disease to take reishi. It is often used as a general tonic for good health and proper immune system functioning. Pills or tablets. These are made by grinding up the mycelium or fruitbody of the mushroom. Most research indicates that the fruitbodies are more effective in fighting disease so try to find pills made from those. For normal health maintenance and bronchial diseases a dose of 1-6 grams is standard. More serious diseases are usually treated with a 9-15 gram dosage. Start with a smaller dose and work up to a larger one so your body has time to adjust. Extracts. The active ingredients are concentrated into a liquid using either alcohol or hot water. The label will tell you how many drops is equal to a gram of the mushroom. The extract can be added to a drink, smoothie, or placed directly on the tongue. Learn how to make your own Ganoderma extract here. Dried reishi mushrooms. These can be purchased as a whole or in powder form. They are too tough to eat but will be effective as a soup or tea. To make reishi tea, either grind whole mushrooms or slice them into long strips. Measure the amount you want and boil in water for a few minutes. Then reduce the heat and simmer the tea for 1-3 hours. Filter the water using cheese cloth or a coffee filter. More detailed mushroom tea instructions are here. Be aware that the tea will be very bitter! Some fruit juice or honey will make it taste better. You can also use this reishi tea as a soup base, as your water to make rice, or even in coffee. I image you could freeze it and make "frozen reishi pops" although they may be too bitter for a summer treat! The dried powder is also useful in making "reishi spirits". Place some powder in a bottle of your favorite vodka, rice wine, brandy, or other alcohol. I'd recommend around 20 grams of dried mushrooms per bottle but you can experiment to suit your tastes. Let this mixture sit at least a month and strain the powder when serving. Now you can have some triterpenes with your next dinner party! Reishi's effects are cumulative. You probably won't notice anything after taking it just once or sporadically. Take it every day and be patient. It can take a few weeks to 2 months to notice an effect. Take all pills, powders, and teas with some vitamin C. Research shows that vitamin C increases the absorption of polysaccharides in the body. So add an orange or a multivitamin to your reishi routine! Be aware of companies that make outrageous claims. Statements like "magic pill", "cancer cure", and "reverse aging" are simply not true. Reishi supplements are big business and there are lots of people out there trying to get your money. So although I had found many answers to my travels and research, some questions remained. Has reishi's "spiritual strength" come down from the sacred mountain of the ancient Taoists to aid us at this important historical crossroad, when Western society's health problems seem insurmountable? Will reishi help direct us towards a new medical theory, one that encompasses both Eastern and Western concepts? Have Something to Say about Reishi Mushrooms? Do you take reishi medicinally? Have you found it in the wild? If you have something to say about this beautiful mushroom share it here!